Lytras introduced national characteristics into genre painting, with which he was intensively preoccupied from the 1870s on. Dating from that period, The Orphan Girl in the A. G. Leventis Foundation Collection went on display for the first time in an Athenian jewellery store in 1876, before being shown at the Exposition Universelle in Paris two years later. 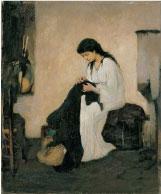 The painting depicts a young woman with long brown hair in a white petticoat, mending a black mourning dress, seated on a chest in a humble interior. In the niche on the left there are two long white candles, tied with black cloth, and a loaf of Eucharist bread, alluding to loss and orphanhood. The modest, bashful figure exemplified the model of the typical Greek maid and was regarded in this way by contemporary criticism. 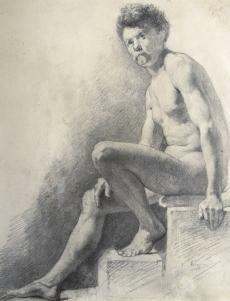 Demonstrating his mastery in handling white, Lytras had only to use a minimum of means to achieve the sparse, low-key effect he sought, focusing on conveying the sitter’s inner state. 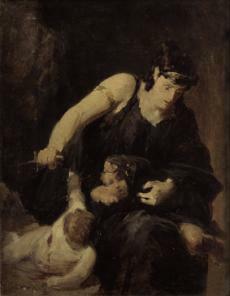 Medea, on the other hand, an oil painting as dynamic as a sketch, probably dates from the 1860s and the period of Lytras’ studies in Munich. Drawing his inspiration from Greek mythology, here he captured the dramatic moment when Medea killed her own children to revenge her husband’s betrayal. He studied at the School of Arts in Athens (1850-1856). He worked as assistant to Ludwig Thiersch in painting the Russian Church in Athens(1853-1855), then went on to study at the Munich Academy on scholarship (1860-1865). 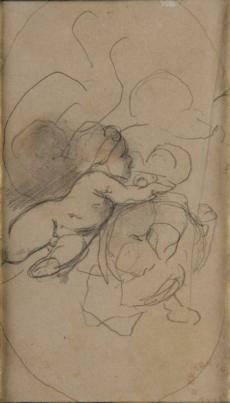 In 1866 he was appointed as professor at the AthensSchool of Fine Arts, where he taught for the rest of his life. In 1873 he travelled with Nikolaos Gyzis in Asia Minor and in 1874 visited Munich,where he worked for nine months. In 1879 he visited Egypt. He participated in the Paris Exposition Universelle (1855, 1867, 1878, 1889, 1900),international exhibitions in Europe (Vienna 1873, Berlin 1876, Munich 1879) and events in Athens. He received the Gold Cross of the Saviour(1903). In 1933, the Athens School of Fine Arts held a major retrospective exhibition of his work. He is considered the ‘patriarch’ of Modern Greek painting, who established the School of Munich, a movement embracing comprehensiveacademic qualities that marked artistic production in the visual arts in 19th-century Greece. He established genre painting as the dominanttheme, while also contributing to the development of the mature phase of upper-class portraiture.